Looking up words in the Mongolian traditional alphabet is quite different from looking up words in English dictionaries. For English, you just need to know the order of the letters of the alphabet and you can find any word (except inflected forms) purely from its spelling. This approach does not work with Inner Mongolian dictionaries. Dictionaries in the traditional alphabet assume you know how the traditional script is taught in schools. In particular, you need to know the traditional written pronunciation (as opposed to the modern spoken pronunciation) of the word. 1. Whereas English dictionaries are split up according to the letters of the alphabet, based on the first letter of each word (starting with the letter A, the letter B, etc., right down to the letter Z), Mongolian dictionaries are divided up according to the first syllable of the word. 2. 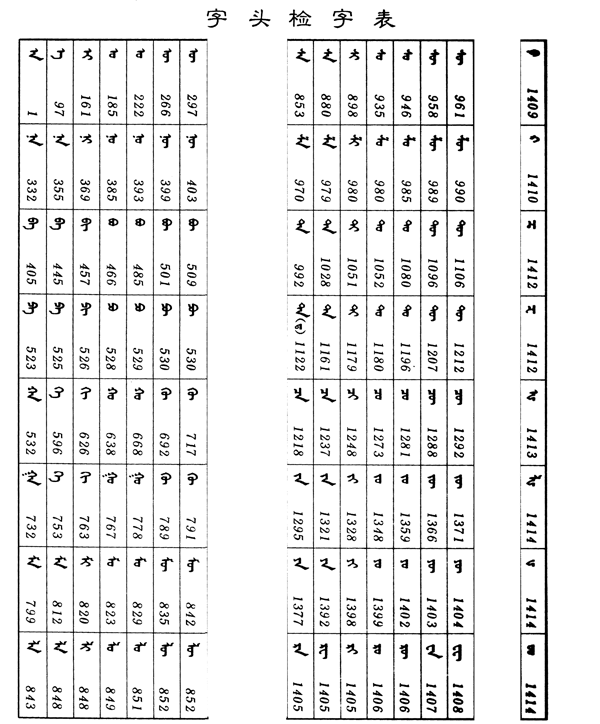 The order of syllables used is that taught in the school system (see Making sense of the Traditional Mongolian Script), which arranges syllables in a table. 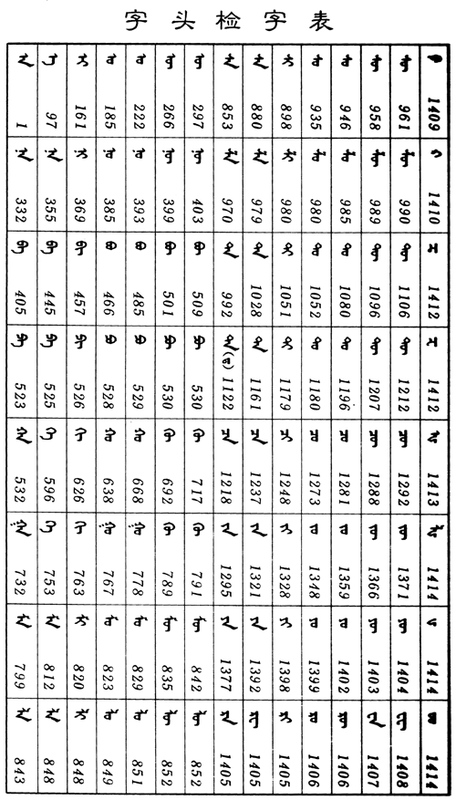 Since Mongolian letters may have more than one pronunciation, syllables that are written identically but pronounced differently are kept separate in the syllable tables. Accordingly, in Mongolian dictionaries, words that have initial syllables that are written identically but pronounced differently are assigned to different sections of the dictionary. 3. As a result, looking up words for which the (traditional) pronunciation is unknown can involve looking through two, or possibly four different sections of the dictionary. a. At the end of a word, closed syllables (syllables that end in non-syllabic consonants) precede open syllables. Inside a word, closed syllables follow open syllables. b. Vowel-lengthening letters or diphthongs (open syllables) follow their normal ordering as vowels. The following table is the index to the Mongolian-language dictionary at miniovoo.net and demonstrates the standard order used in Inner Mongolia. (The table is in the printed form of the alphabet. For conversion between printed and handwritten forms, see Conversion tables). The table is to be read from top to bottom, starting at the top left hand corner and working to the right. Cyrillic: н, б, п, х, г, м, л, с, ш, т, д, ч/ц, ж/з, й, р (note that some classical consonants have split in two, represented as ч/ц, ж/з in Cyrillic). The final column (on the right) shows letters used in foreign words: va, fa, ka, tsa, dza, xa, lxa (Cyrillic ва, фа, ка, ца, за, ха, лха). The vowel sets a and ə, ɔ and ʊ, and o and u are not systematically distinguished. (In Cyrillic this corresponds to а and э, о and у, and ө and ү. In conventional romanisations it corresponds to a and e, o and u, ö and ü). The consonants x and g / ɣ (corresponding to Cyrillic х and г) are not distinguished before feminine/yin vowels. The consonants t and d (т and д) are in practice almost never distinguished. The index below indicates in graphic form those syllables that are ambiguous as to pronunciation. 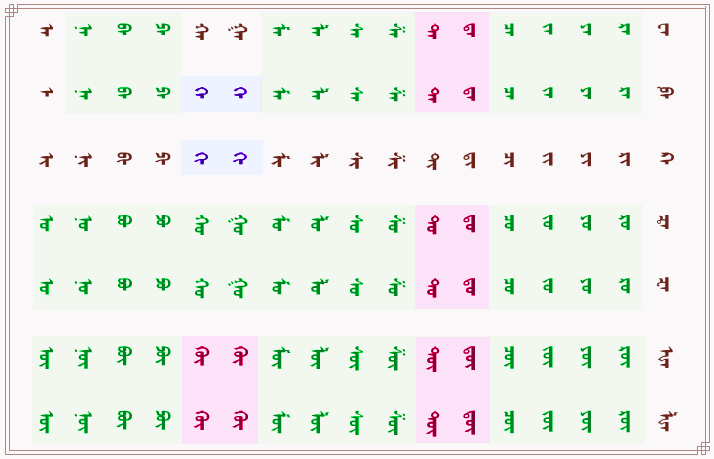 Syllables ambiguous between two vowels are shown in green; those ambiguous between two consonants are shown in blue; those ambiguous between both vowels and consonants (four possible readings) are shown in maroon. In looking up a word, the user must mentally convert the syllable to its correct pronunciation in order to find the word in the dictionary. If the user does not know the correct pronunciation, he/she must be prepared to check the word in two or more different sections. The situation is not, of course, quite as dire as it appears, since the a and ə (Cyrillic а and э) rows can often be distinguished if there is indication of vowel harmony in the word. But in many cases, without knowing the correct pronunciation, the user is condemned to looking through several different parts of the dictionary. One feature of the 蒙汉词典/Cyrillic: Монгол Хятад Толь and the Монгол Хэлний Толь is the provision of a romanised form for each entry. This is given in a conventional romanised spelling. If a letter is meant to be interpreted as 'e', the romanised form spells it as 'e'. If a letter is meant to be 'a', the romanised form spells it as 'a'. This is extremely helpful as it reveals the form of the word used in ordering entries. While not help much in looking up words, it does reveal the correct interpretation of ambiguous traditional spellings. For example, the entry is given in 蒙汉词典 with the romanisation dalai. This indicates that the word is interpreted as dalai in the traditional spelling. That is why it is found in the section for da. Additionally, this dictionary then gives the modern Inner Mongolian pronunciation for each entry using the IPA alphabet. In this case this is dalæ:. The same form is found at another location in the dictionary with a different meaning, with the romanisation telei. This indicates that this word is interpreted as telei in the traditional spelling, and is thus found in the section ta. The modern Inner Mongolian pronunciation is təli:. The use of two separately conceived romanisations, one for the traditional spelling, one for the modern Inner Mongolian pronunciation, can be confusing. To use a different example, the same word is represented as čöm for the traditional spelling and as ʧom for the modern Inner Mongolian pronunciation. While the system of romanisation is different, these represent virtually identical sounds. Some dictionaries (Монгол Хэлний Товч Тайлбар Толь and Монгол Хэлний Толь) give the modern Cyrillic spelling of each entry. The following are a few examples of what this method of organising the dictionary entails. is simple to look up because there is only one place to look, under e (Cyrillic э). The second syllable is also a simple . The meaning is 'mother' (Chinese 妈 mā), modern pronunciation ə:dʒ. must be checked at two places, bo and bu (Cyrillic бо and бу). Both are written . Upon checking both we will find that only one of these actually exists, with the traditional pronunciation buɣu (NOT boɣu). The meaning is 'deer' (Chinese 鹿 lù), dictionary entry shown at right. must also be checked at two places, xo and xu (Cyrillic хо and ху, other traditional romanisations ho and hu or kho and khu). Both are written . Upon checking we will find a word with this spelling at both places. As xola it means 'far'; as xula it means 'yellowish-brown, fawn'. The modern pronunciations are xɔl and xʊl (Cyrillic хол and хул) respectively. The two dictionary definitions are shown at right (Chinese 远 yuǎn 'far', 金黄毛 jīnhuángmáo 'golden-yellow hair (of horse)'). must be checked at four places, under ta, te, da, and de (Cyrillic та, тэ, да, дэ). All are normally written . Upon checking all four, we will find two words that are spelt this way: dalai ('sea') and telei ('waist-cord, belt'). In their modern pronunciation they are dalæ: and təli: (далай and тэлий) respectively. Dictionary entries are shown at right (Chinese 海 hǎi 'sea' and 裤带 kùdài 'trouser-cord' respectively). also 'medical dispensary' modern Cyrillic жор. ǰori The consonant r is followed by the final vowel i. 'Target', modern Cyrillic зорь (sometimes seen but not listed in dictionaries). ǰorixu ri is followed by the open syllable xu (consonant followed by vowel). 'To strive, to aim for', modern Cyrillic зорих. ǰoriɣ ri is followed by the word-ending consonant ɣ (ɣ follows x in Mongolian alphabetic order). 'Bravery', modern Cyrillic зориг. ǰoriɣulxu ri is followed by the syllable ɣu (consonant plus vowel). 'To dedicate, to do sth for', modern Cyrillic зориулах. ǰoriɣtai ri is followed by the syllable-final consonant ɣ within the word (consonant plus consonant). 'To be brave', modern Cyrillic зоригтой. ǰoro The consonant r is followed by the final vowel o. Part of expression meaning 'be arrogant, overbearing'. Modern Cyrillic зор. ǰoroxon ro is followed by the syllable xon. Part of expression referring to 'wren', in modern Cyrillic зорхон. ǰorxu r is followed by the syllable xu. 'Whittle, plane', modern Cyrillic зорох. ǰorlong r is followed by the syllable long. 'Toilet', modern Cyrillic жорлон. 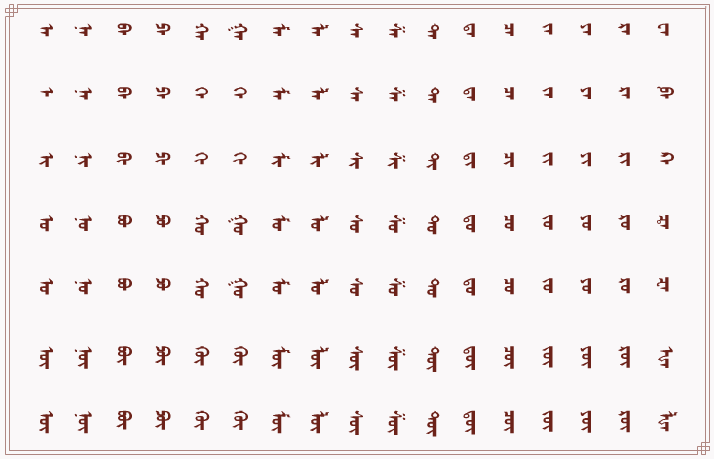 ǰortai r is followed by the syllable tai. 'Lucky', modern Cyrillic зортой'. ǰortʃixu r is followed by the syllable tʃi. 'Go back and forth, travel, totter (infant's steps)', modern Cyrillic зорчих. The examples at ri show this principle in action for ɣ / ɣu / ɣ. The same applies to other letters. At the n series, note that syllable-final ng precedes syllable-final n (similarly for word-final forms). The decision to split entries not purely according to spelling but according to the traditional pronunciation of the syllable makes using a Mongolian dictionary much less convenient than it should be. But your travails will be needlessly aggravated by the way the index is set out in the endpapers in the 蒙汉词典 / Монгол Хятад Толь. This is the list of syllables (sections) in the dictionary, an arrangement which is guaranteed to make the eyes glaze over. (Note: this table uses citation forms of the syllables, unlike the minivoo.net dictionary). The table actually consists of three parts, as shown below. Once the table is split up it becomes more usable.